From 25 May the new privacy legislation is in force. And yes… for weeks you have seen everywhere the 4 most hated letters of the web: GDPR. And even today, 2 weeks after the new regulations come into force, there is a lot of confusion. In this article you will learn what we have done to get Needyesterday GDPR compliant and sleep well after that. So we thought about sharing our experience and what we did to make Needyesterday GDPR compliant. What will follow will be a series of tips and tricks that we used for for our site. Disclaimer: I do not want to replace any legal expert (which I always recommend consulting) but I want to help you by addressing the GDPR with a practical approach and without technical terms (that you find in the glossary I have included). I want to immediately tell you this: if you are not the CEO of large company, then most likely making your site GDPR compliant will not be a big deal. Relax. A glossary with all the most common terms used in the new GDPR regulations. What data you collect, how and for what reason. and perhaps, in some cases, the link of your client’s site. You probably acquire this data through a Contact Form or through your newsletter. And most likely you use this data to send an estimate on a new project, to update and communicate with your client or to do web marketing through your mailist. If you recognize yourself in this analysis, then you have already completed the first step to be GDPR compliant. In fact, this is one of the most important things to do: understand what data you collect from third parties and how. Do this step before any technical intervention or any investment in tools or plugins to make your site GDPR compliant. This first step is crucial because the GDPR aims to make the management of sensitive data more transparent, so for the next step it is important to have this solved this point. I have added below some questions that can help you complete the first step. Which plugin or tool is collecting data? Who will be the data shared with? What will be the effect of this on the individuals involved? Answering these questions you will surely give you a clearer idea of what to do to make your site GDPR compliant. How do we get data from our users? In the case of our optin-form, we collect just name and email. When the user is interested in working with us or in a partnership, we also request to provide a link to their portfolio and Linkedin profile and their role. And for what reasons do we ask for these data? In the case of our optin-form, we offer free access to all our freebies immediately after sign-up to the newsletter. In the case of our contact form, we request user data to process requests and never use data in any other way except to respond to support requests or to requests for more information. I believe a good way to make your website GDPR compliant is simply to treat your users’ data as if it were your personal data: with the utmost respect and only for the reasons you stated. If you do not give your users data to third parties, if you do not take any data without your consent, if you have the utmost care and common sense to keep this data, you are and will always be GDPR compliant. The second step is to inform how you will use the data you collect in the clearest and most transparent way possible. and ask the user’s name and email to give access to your resources, then it will be immediately clear why you are asking for that data. If you enter your name and your email here I will give you my free resources. What does this mean? That the user is aware of the fact that his data is needed to get your free resources. At this point you probably have a question in your mind: Do I need to add a checkbox requesting explicit consent to the subscription? Drumroll… and the answer is simple: NO. Why? 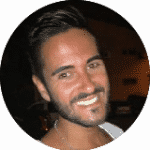 Because as described in this excellent article by Tim Strifler the user is already aware immediately of the reason why you are requesting the data. For example, on our Freebies page, through the optin-form in the Header we ask for the name and the user to give access to a .zip package that includes all the free resources. The reason why we ask for the data is clear. The same principle applies if on your Contact page you ask for data such as Name, Surname, Email to send an estimate for a new project. We didn’t do much extra to be compliant. We have always preferred to be transparent starting from the copy we use. So the user is immediately aware that his/her data are mandatory to get free resources and to be informed on our new tutorials and offers. This made it unnecessary to add the infamous checkbox that is surely destined to remain one of the most discussed points of the new privacy regulations. Our users’ emails are never used for remarketing or other purposes not described. 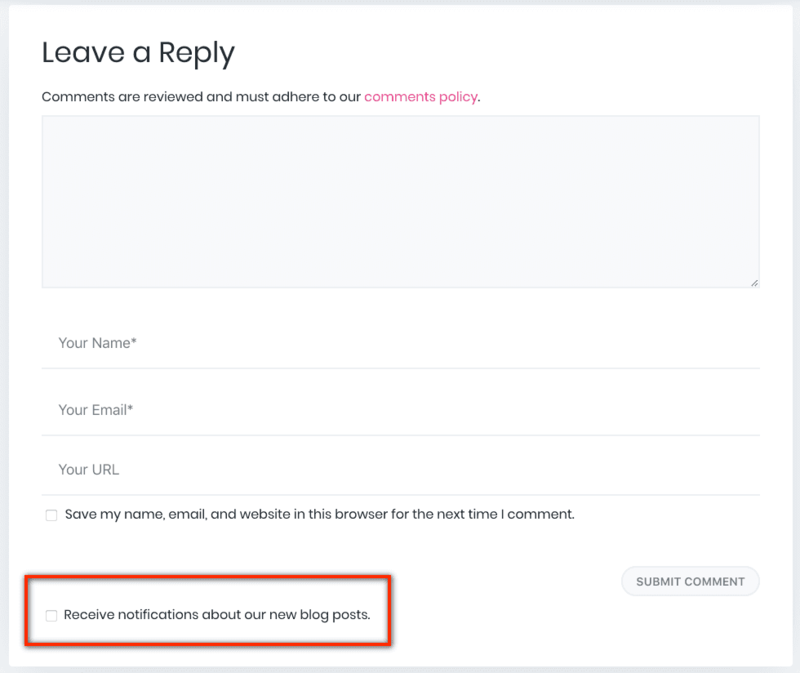 So we did not have to add any checkbox that asks for explicit consent as done for example in the Comment Form of the Elegant Themes blog. Another important point of the GDPR is access to the collected data. What does it mean? It means that all users must be able to request the cancellation of their data to respect their right to be forgotten as established by the GDPR. The ability to export and delete user data is a feature that was introduced with WordPress version 4.9.6. The same applies to data stored by Woocommerce that can now be exported and deleted using the new WP export feature 4.9.6. Another thing introduced by Woocommerce is the ability to determine how long you will keep your customers’ data when it is no longer necessary for order processing. Many plug-in developers will introduce similar tools or native integrations with WP’s Data Export, so in the coming weeks we can certainly expect news that will make access to the stored data easier and faster. And what about the data collected by Woocommerce? With regard to Woocommerce, the data used to process any Orders will also be deleted and then we decided to keep data for a maximum of one year for completed orders (see screenshot #1). You can also use the Delete Me plugin that will help you easily manage the request for access and deletion of the collected data. 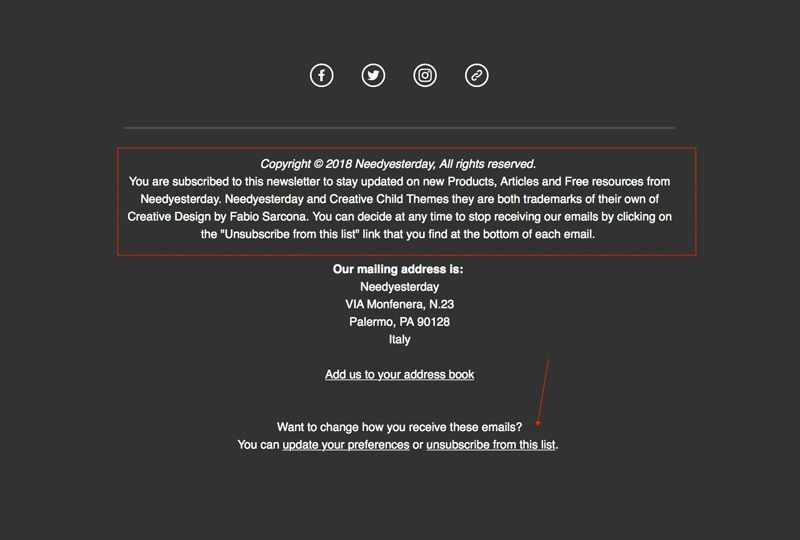 Regarding subscribers to our newsletter, we give a quick and easy way to unsubscribe – meaning stop receiving our email, not deleting their data, Mailchimp as many email services don’t delete user data after an unsubscribe – by inserting a link in every email we send along with a short note reminding you why they are subscribed to our newsletter (see screenshot #2). You will have already heard a thousand times about cookies, what they are and what they do… so I do not want to add to bore but I want to talk about what the new legislation request to be Cookie Compliant. Given before the installation of cookies. This means that no cookies, except technical cookies, can be installed on the site prior to the user’s consent. Inform users about what cookies you use. Your users need to know what cookies you use and for what reason and you must do so by providing specific and clear information about what they are giving their consent to. Keep track of consent. All consent data must be stored securely to provide evidence of consent in the event of a check (check out the screenshot below). Renewed once a year. Cookies must be renewed every 12 months, so they can not be stored later than this period. 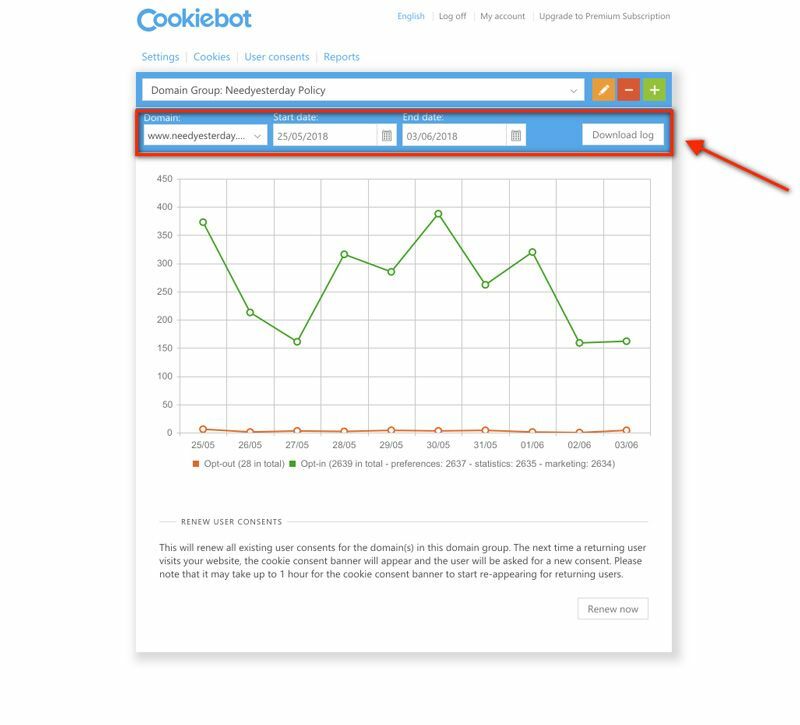 For the Cookies Consent we have chosen to use CookieBot a cloud service that does an automatic scan of the site by detecting the cookies used and allows you to obtain preventive blocking of cookies, to ensure the use of the site even without consent to cookies not strictly necessary and access a downloadable CSV document that tracks all the consents obtained. If you want to know more about the Cookie Consent, I recommend this great article Cookie Consent | How I do comply with the GDPR? All you need to do is choose those in use on your site and Iubenda will automatically create your Privacy page. The annual cost per person / language is $19 but if you use this affiliate link, you get a $10 discount on the first year of subscription. Always automatically, Iubenda generates the text with the regulations provided by the GDPR and updates automatically if the regulations change. it’s very easy to integrate because there are several ways to include Iubenda on your site: you can use a WordPress plugin, but I recommend the Embed code solution directly on your Child Theme or in the Divi Options panel (in the Integrations tab). 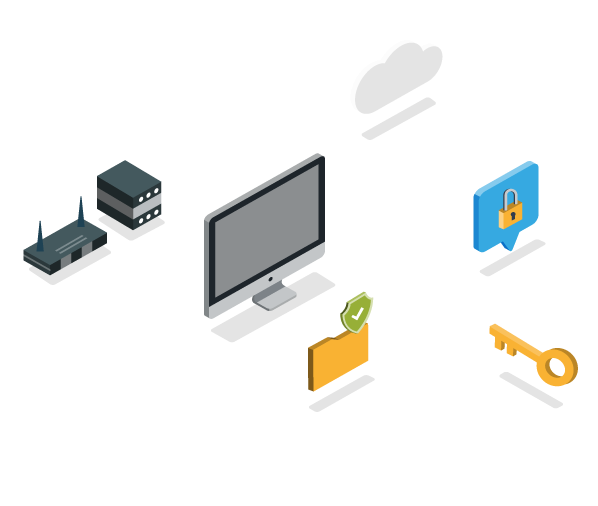 Last week Iubenda also released a new tool for managing and storing sensitive data, a specific tool for GDPR. 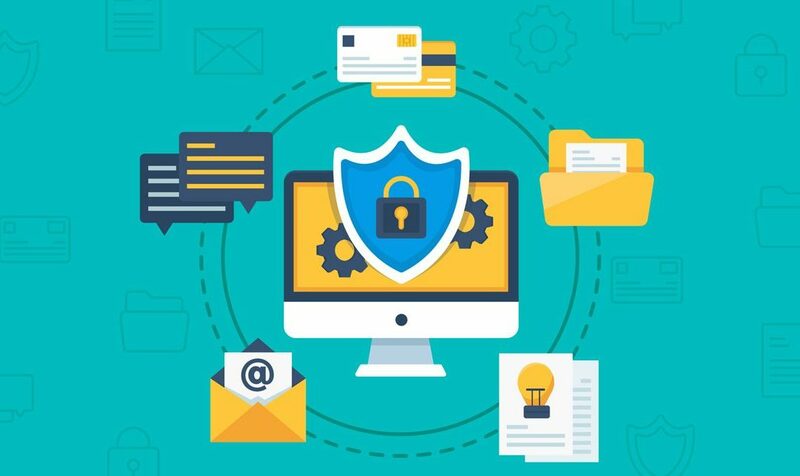 The cost is $29 per month and it is an excellent solution if your site or your clients’ treat sensitive data such as Clinical Data, Bank Data, and other data that need more complex management. Iubenda generates a banner for the consent of Cookies but it does not prevent cookies from being prevented as required by the regulation. For this reason we at Needyesterday have preferred to use CookieBot which scans your site and automatically generates a preventive blocking of cookies installed on your site. the requirement for controllers to provide the data subject with a copy of his or her data in a format that allows for easy use with another controller. any entity engaged in economic activity, regardless of legal form, including persons, partnerships, associations, etc. any operation performed on personal data, whether or not by automated means, including collection, use, recording, etc. informal negotiations between the European Commission, the European Parliament, and the Council of the European Union usually held following the first readings of proposed legislation in order to more quickly agree to a compromise text to be adopted. I think the GDPR will continue to be a “hot” topic for quite a while. Just ask “What have you done to make your site GDPR Compliant?” To see a flurry of comments and opinions all different from each other. From my point of view – which is not that of a lawyer or privacy expert – think that if you have always made a correct and transparent use of your users’ data, you have never given any third party an email and you respect the privacy of others as if it were yours, you have already done 90% of the work to make your business GDPR compliant. Subscribe for FREE Divi Tutorials, Offers, Freebies & More! Write your email below and get the FREE Divi layouts and our course "How to build your web design brand". Send me the free stuff! Your email is safe ?. We hate SPAM same as you! Many times when building a website, it makes one of the most serious mistakes to focus too much on design and less on what it really is imported: the conversions. This is a very simple bar: I added a text to the left and a button to the right to push the user to make an action. I chose to place the text on the left and the CTA on the right for a reason and this reason is called Visual Hierarchy a much used term when designing the UX of an interface and that is to place the interface elements following the normal human eye displacement, from top to bottom and from left to right (except for some countries). So keeping in mind that “flow”, I’m going to place the text on the left and right button, so the user first reads our message and we attract his attention with a button that must always be clearly visible. By now we all know: the traffic generated by the mobile exceed that generated by desktop, this means that it is very important that each element and each page is fully optimized to provide users with a good user experience, even via mobile. That’s why I created this three layout that allows you to add 4 call to action in pure style Mobile App. Maps button, great when you want to show the location of a shop or office quickly, for example in the case of a restaurant. Call button, a quick shortcut that allows you to make a call to the number you want, with just one click and without any waste of time. Contact Us button, to immediately open the email provider for fast communication. Support button, a button that you can use to target your users to the support page of your site. Of course, you are just an example, but you can easily customize every call to action in a few minutes. NOTE: This bar is only visible on Tablets and Smartphones. So that’s all. But now I have a question for you: do you think you use this call to action in your site? Already use some tricks to increase conversions? 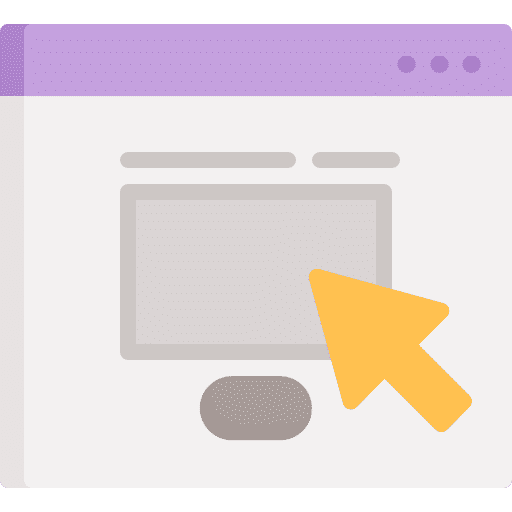 In this new tutorial I will show you how you can add an animated sticky menus to your website and add shortcuts that can improve the user experience. The first thing you have to do is download the child theme that I have prepared, and which already contains the JS and CSS code needed to run properly the menu. Then download the file and open the .zip package. 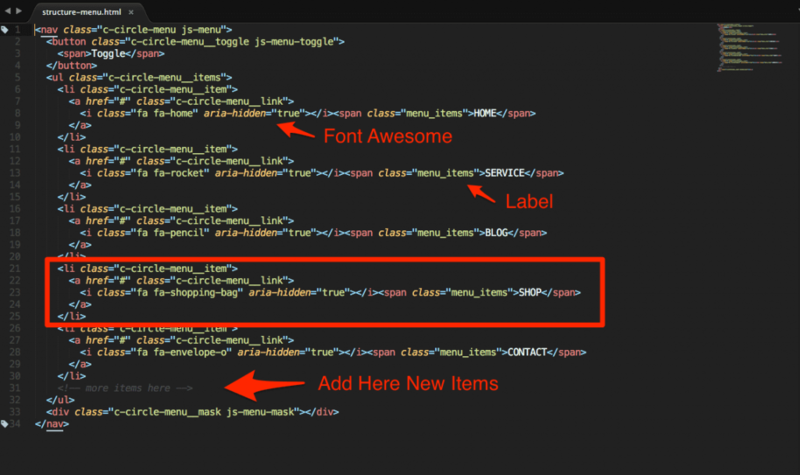 Circle-Menu-Layout.json, a “Code” module that contains the HTML code for the menu structure. 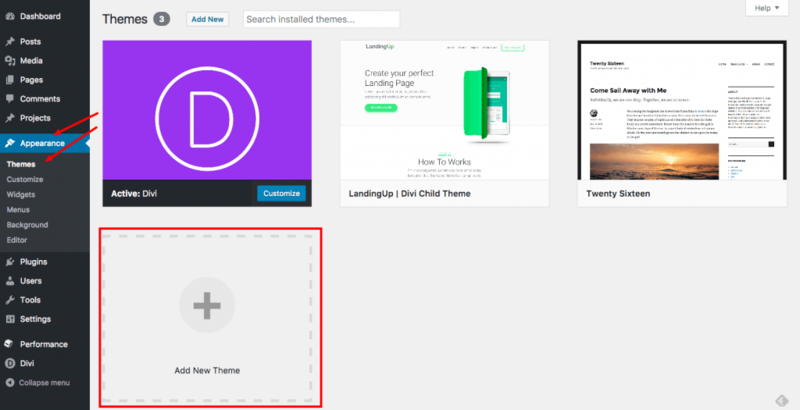 You have to do now is load the child theme in your WordPress and activate it. Go to Appearance > Themes > and click on the Add New Theme. After click on Upload Theme and install the child theme. Now only missing the last step, import the JSON file in the library and upload the page where you want to add your new menu. That’s all you need to do to add a submenu to your website. If you already use a child theme.. Step 1: Log in to your child theme folder via FTP and add the JS files that you can find inside the package. 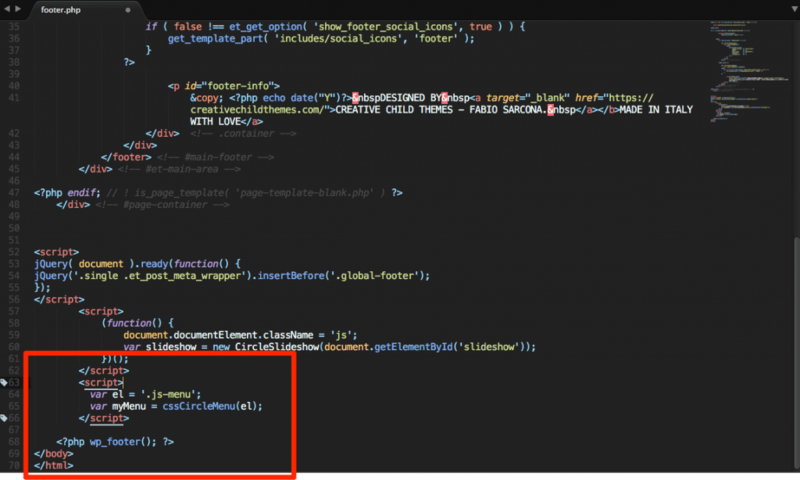 NOTE: This code is used to load properly a js file in WordPress. Step 4: Add the CSS code (which always are inside the .zip package) in your stylesheet. Step 5: Import the JSON file in your library and add the new menu in the pages that you prefer. Icons: I used Font Awesome for icons, so all you need to do and add icons of your choice. New Items: You can add new items by copying the list item. as you can see the code is a single block and this makes customization definitely more difficult, so I thought I would add a further package in .zip files with HTML code that you can customize using your favorite editor. That way when you have applied your changes, you need only copy and paste the code inside the module. Finally I thought I’d give you some ideas to make the most of this new menu, for example, you could use it to open messenger, how? it’s very simple! Use this link https://m.me/XYZ and all you have to do is replace “XYZ” with your Facebook vanity username. 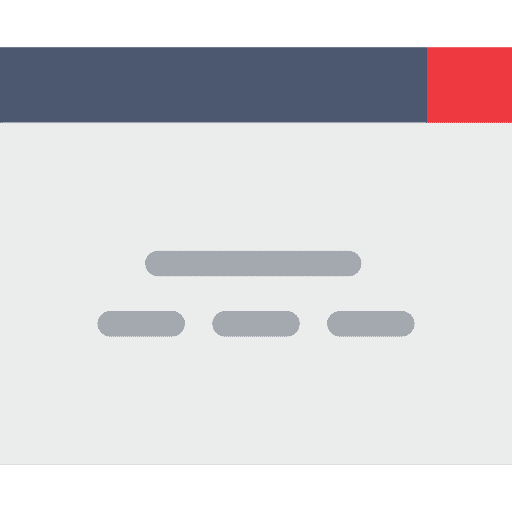 Another possible use that comes to mind is to create a trigger button to open a pop-up with a contact form or a form to subscribe to the newsletter using the plugin DIVI POP-UP MODAL. How do you plan to use these shortcuts in your projects? you have some ideas to share? Write it in the comments ? In the next tutorial I’ll show you how to create a beautiful CTA bar with a Mobile App style. Do you want to preview it? Open the link below from your smartphone or tablet ;). As promised, here is the second part of the tutorial “How to customize the footer” I promised you two weeks ago. I know, I told you that would be available last Friday but unexpectedly blocked me for a few days and then I had to postpone the second part of the tutorial. In this second part, I show how to use two layouts (3-4 View Demo) that are constructed with two different sections. NOTE: These two layouts are only for newsletter subscribers. Do you anticipate that it will be much shorter than the previous tutorial because the steps are nearly identical to those already seen in the previous tutorial, but with a small difference that I will show you in a video to make things even easier. 3. To add the CSS code (found inside the package .zip – Footer Custom 2.0) in the options panel or in your child theme. 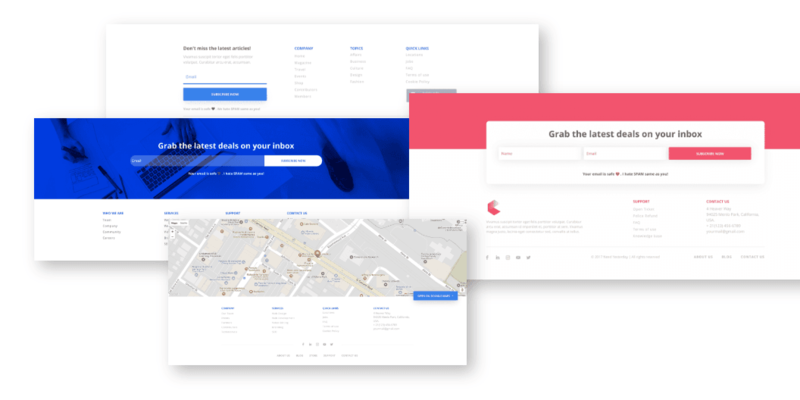 On Needyesterday you will find 10 ready-to-use layouts for your Footer. You do not need any plugins and like all our pre-made section, they are all compatible with the latest version of Divi and 100% Responsive. That’s all. As you see you can create a footer that uses multiple sections, this allows you to be able to really give rein to your creativity without limits. For this week it is all about, as always I wait in the comments to know your opinion or to answer your questions. In all my projects I always love to add the details that can make only the end result of my work, and something what I can not live without. Sometimes I happen to “pause a project” to find the right inspiration to create an item, a layout, a combination of colors, font, that is original and special I call it “my signature” and the same the approach used to create some new layouts that you can use to make more attractive the footer of your website. 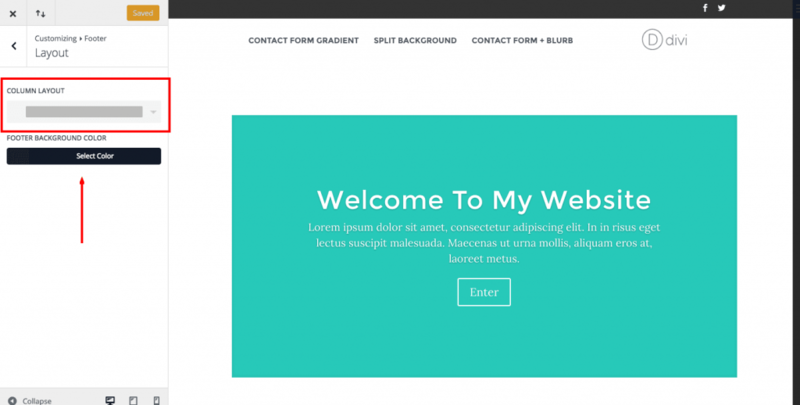 In fact, in this article I show you how to customize the footer of Divi in a few easy steps. As always, before we left I show you the end result. (Note: For this tutorial I will use the #1-layout). The Divi Widget Builder It is a plugin (premium) developed by SJ James of Divi.space that allows you to turn any item stored in the library for a widget and that will be useful for this tutorial. If you’ve read my previous tutorial where I showed you how to customize the header of Divi then you have already installed this plugin then you can move immediately to the next step. Now all you have to do is build your own footer layout with the Divi Builder you save the result in the library, but remember to turn on the “Make this a global item” option that will make it quick and easy for future customizations. To learn more about the advanced settings of the module you should read the official documentation. If you instead want to use the layout seen in the demo, you can download the template by clicking on the button. 2. File CSS: open this file and copy and paste the CSS code in the options panel or in your child theme. Now go to Appearance > Widgets and drag & drop the widget “Divi PB Widget” within the Footer Area #1. Now select the items that you created or if you have imported the pre-made layout, select the item “Footer Custom 1 (CCT)“. Note: remember to disable the option: “Display Library Item Title“. Now open the Customizer settings, and go to Footer > Layout and select from the drop down menu the single column and the background color that you give to your footer. 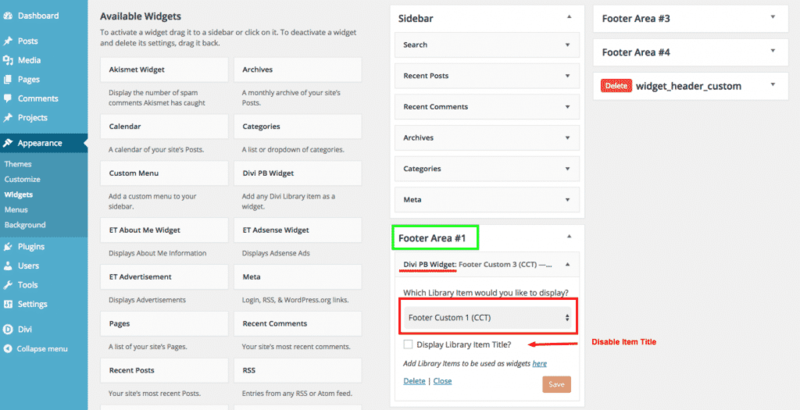 Save the settings and enjoy your new footer ?. 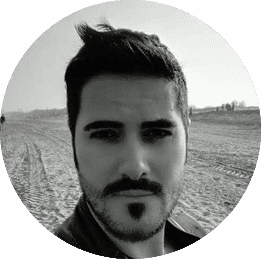 The tutorial is over here but below I have added a CSS code snippet that you will need if you want to create your own custom layouts to be used for the footer. What this code is very simple, because it customizes the width of the widget but to do so you will need to add the class custom: footer_custom for the Section, and the class: row_custom_footer for each Row you add in the section. Below I added a screenshot that makes it easier to understand where you need to add custom classes. One thing I did not tell you at the beginning of this tutorial, and there will be a second part where I show you how to use the layout 3 and 4 seen in the demo. These two layouts need a dedicated tutorial so I decided to create a second part where there will also be a video that will make everything easier. what do you think of this hack? Will you use it or do you prefer the default layout? NOTE: the 2-3-4-5 layout that you can view the Demo they are reserved to the members of the newsletter. Have you ever had that moment when you turn on a light bulb in the head and suddenly you think of an idea? It is what has happened to me before you think of this trick which will show you how to customize the header of Divi for a completely new look and cool. but I guarantee that at the end of this tutorial you’ll know to create your own personal layout in a few minutes! 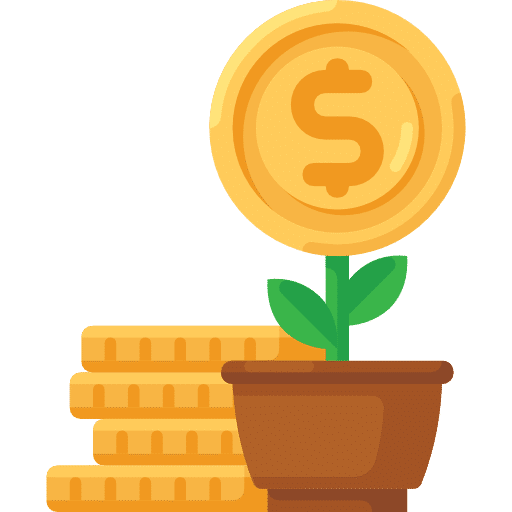 Note: If you have just started to use the Divi or you are a total beginner, maybe you could find this article a little more advanced, but if you follow all the steps in a careful will become easy for you. I wrote this tutorial in July 2016 and until a few months ago, it was not possible to get a custom menu without a hack like the one described in this tutorial. Now on Needyesterday you can find 10 Header Navigation pre-made Layouts that allow you to get a custom menu with a few and simple clicks. Check out our Amazing pre-made layouts now! A bit of creativity and a bit of patience to grammar mistakes you’ll find in this article ? First you have to set the header layout centered, then with CSS code move the logo and menu on the left. To set the Centered layout go to Theme Customizer > Header & Navigation > Header Format > Header Style. In the demo you will have seen that I have added icons for social networks, to add them I used Font Awesome you just add to your menu as shown in the screenshot you can see below. But beware, if you want to place on the right of the menu you add custom class: social_header. Great, the first step is completed! to automatically create a child theme, but both do not automatically create the header.php, essential for this tutorial, so after you’ve generated your child theme, look and open the parent folder of the Divi theme, here you will find the header.php file that you must copy and paste into your new child theme folder. That done, you will need to copy the file to the child theme folder you created previously, in this way you will have successfully created your first child theme :). The hardest part is over, now from here on and all downhill fact what we now need to do is just use the Divi Builder to create a section with items you want to display in your header and save it in the library, because we need this next step. I’ll give you some examples: Want to show your contacts and a button with a call to action? Well, then it creates a section in three columns and add two blurb for contacts and a button for the call to action. Want another idea? Take the case where you’ve created an offer with a deadline, you can add a module text with a short description, a countdown module and a button. As you see, nothing you do not already know :). Now you will need to download and install Divi Widget Builder, a free plugin (NOTE: when I wrote this tutorial the plugin was free now it costs $7 for single site.) developed by SJ James Divi Space really very useful and smart, because it allows you to turn any item stored in the library in a widget, and it’s just fantastic. After installation you will need to activate the plugin and go to Widgets page (Appearance > Widgets), here you will find a new Widget called “Divi PB Widget”. The next step is to create a new widget area and guess where will the new widget area? That’s right, the header. Usually you can give any name to the new Widget Area, but for this tutorial we will call widget_header_custom, then you will need to give this name to the new area. If you paid attention, you’ll notice that it is the same name used in the header.php file to bring up the new widget area. After you must click on the Create button and the new widget area will be displayed at the top. Note: if you do not immediately see the new widget area, you just have to do a page refresh. You Should now see a new widget on your screen area, now you need to do a drag and drop and add the widget “DIVI PB WIDGET” within the new area widget. Now download the template that I created for you and import the JSON file in your library. After importing the template, return to the widget area you created earlier and select from the drop-down menu the layout / item Header-Custom-CTA. Uncheck the “Display Library Item Title?” and then click on save. We’re almost there, just missing the last step, the CSS code. We’re almost there, just missing the last step, the CSS code. 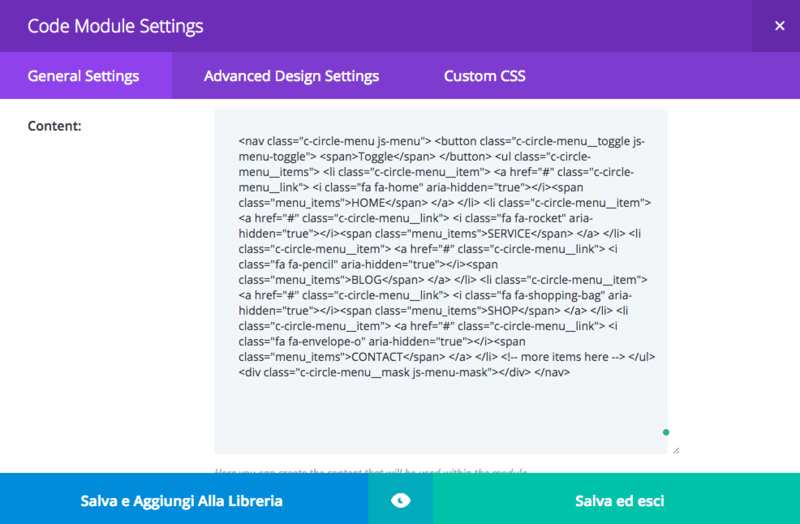 Now go into the Divi options panel or in your child theme of the style.css file, copy and paste the code found below. Of course, this code allows you to operate the specific layout shown in the demo, so if you create a new layout will probably have to customize this code. In the CSS code you can see that there is an ID #divi_pb_widget-8 which refers to the widget used for the header. You probably have to change the number you see at the end with one that matches your Widget that you have created, and to do that you have to open the tools to developers, to enable the inspector and find the class .logo_container click on it and then immediately find the ID of your widget with its identification number of which you will need to add in the CSS code. For all subscribers to the newsletter I reserved 2 Bonus. The first is a template that allows you to add an optin-form header, the second template adds a secondary menu. So that’s all. As you see you can now easily create your own custom header, you’ll only have to test your creativity to create your perfect header. Stay tuned because for the next week I have another tutorial that adds another weapon to your arsenal ? As always I wait for you in the comments! Source Code PHP: David Elster.